Ambergris Caye, Belize, May 24, 2017	(Newswire.com) - Grab the wonderful opportunity of owning a beautiful oceanfront paradise estate of your own in the Southern end of Ambergris Caye, Belize. This magnificent beachfront subdivision is a simple yet sophisticated retreat that combines the enchanting pleasures of nature with the astonishing architecture of its resorts. The Balam Escape is a prime real estate property featuring 3 resorts, which comprise a total of 1,000 rooms and 4,000 dwelling units (villas and condominiums) — a true tourist and retirement destination, with all the basic modern facilities you’ll ever need all rolled into one state-of-the-art natural theme park. Spanning over 1,000 acres, this breathtaking beachfront property graced by soaring landscapes, turquoise lagoons, a fantastic wildlife and an inland jungle forest is a haven for those seeking a healthier and adventurous lifestyle. From the sands of the beaches and scent of the air to the waves of the sea and beyond, the Balam Escape draws you into an atmosphere of pristine natural beauty devoid of smog, waste, and toxins. Its beautiful and vibrant landscapes provide for extraordinary views from the residences of the inland jungle forests and the surrounding ocean. Its extensive stretch of environmental clearance is capable of accommodating up to 500 marina slips, a Green Technology Center, an airport of about 7,000 feet, a 27-holes golf course, an art park, a host village, etc. The subdivision has also received approval for 400+ oceanfront/waterfront lots, accompanied by 2 hotel sites, 2 commercial lots, and 2 condominium sites. Some of the main infrastructures currently being planned for the property include a large solar installation which will be used to provide power, a desalination plant which will be used for providing water and a biodegradable Klargester system which will be utilized for taking care of sewage. There is, however, the main power station, which carries an electricity line presently supplying power to Ambergris Caye and can be used to provide power to the property. The subdivision can be accessed by either road, air or boat, and there is a roadway leading up to the property which passes through a layout of the landscape brimming with luxuriant greenery that continues all the way down to the ocean. Its entire framework is designed to provide a sustainable environment for its inhabitants with huge potential for growth and would be a great investment for any insightful investor looking to purchase real estate in Belize. The Balam Escape represents a vision of a true vacation getaway. The weather here is very accommodating and practically stable all year round. It is comprised mainly of two seasons — the dry and rainy seasons. The days are filled with bright sunny skies while the quiet rumble of the waves brings the cool ocean breeze to the shores during the night. It embodies the true definition of absolute relaxation in total serenity — a place where you are completely surrounded by nature and get to enjoy real quiet and peace of mind. Located at the Southern end of Ambergris Caye — Belize’s number one tourist and retirement destination, the Balam Escape experiences a staggering 200,000 overnight tourism arrivals annually and has thousands of foreign retirees already living there full time. It is rapidly becoming a beehive of activity, with tourism arrivals increasing at approximately 10% every year since 2010 and an expected record high getting set to break in 2017. Since the arrival of airlines like West Jet, Southwest, and Copa Airlines flying to Belize in 2016, work is currently being done to prepare the area for the influx of tourists looking to make Belize their retirement destination. The Balam Escape has been experiencing a major facelift as well, in response to the massive development in the area. 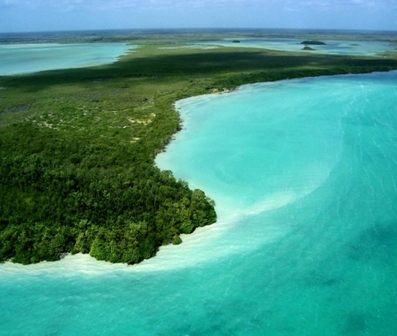 For instance, the Belize Barrier Reef can be easily accessed by boat from the property by crossing the calm, protected waters of Ambergris/Chetumal Bay within 30 minutes, the health care system is advancing to world-class status, the security is highly efficient, and the economy is booming. Investors are highly welcome and much respected in Ambergris Caye. The population here, though little, is very diverse and filled with friendly English-speaking natives who specialize mainly in farming, fishing, and the hospitality business. There are varieties of interesting activities that you can engage in such as scuba diving, snorkeling, fishing, island hopping, or exploring the ancient Mayan ruins of Ambergris Caye. The future is looking really bright for Ambergris Caye, and with the discovery of this tropical paradise by millions of Americans, multinational hotels and resorts are already pitching their tents here. With this development in play, the prices of beachfront properties are looking to skyrocket in Ambergris Caye in the nearest future. So whether you’re a retired, second home investor, or any other, this is an exclusive opportunity to acquire this 1,000-acre beachfront subdivision with final approval and environmental clearance in place. This is the future you have been dreaming of, knocking right on your door. Great opportunity for the right buyer!